Tom Cruise is a helluva performer. People need to admit this. If you’re turned off by his amped up real-life antics and cannot put the crazed Scientologist enough out of mind to enjoy his film characters, then you’re really missing out. 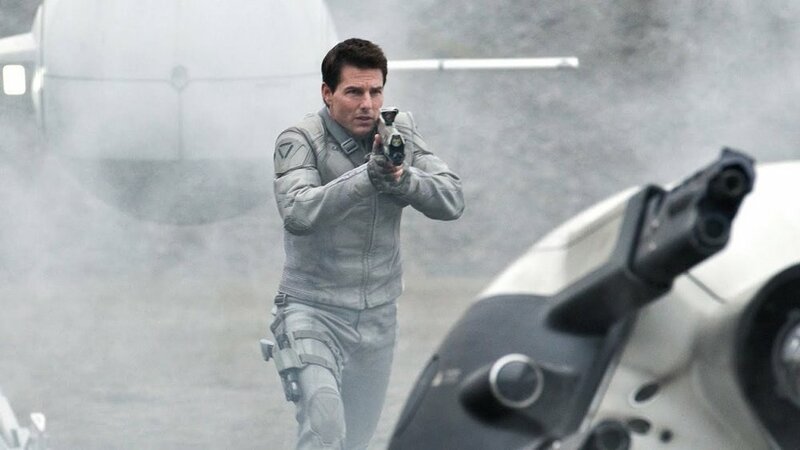 He was an iconic badass in last December’s under-appreciated thriller Jack Reacher, and now he’s back in sci-fi mode in Joseph Kosinski’s Oblivion, delivering a characteristically intense, action-heavy performance that is more complex than it looks. Perhaps Cruise’s greatest strength in these types of films is how he’s able to ground the most ludicrous situations. It doesn’t matter whether he’s climbing the Burj Khalifa, outrunning precrime officers or battling aliens on a charred Earth, he puts human stakes and relatable angst into even the most improbable action sequence. He’s perhaps the best actor at making action scenes character development. In Oblivion, he plays Jack Harper, a recon tech on Earth in 2077. The planet has been devastated from a war with aliens called scavs, black-armor wearing beastly things who bring to mind Tusken raiders from Star Wars, and most people have left to Titan. Jack, and his operator Vika (Andrea Riseborough) are some of the few who remain, fixing drones and protecting giant machines from scav attacks. His daily routine consists of heading out in his dragonfly-like spacecraft, repairing broken tech and trying to not fall prey to the scavs’ elaborate traps. Unfortunately, his routine is disrupted when escape pods land, and one of them contains Julia (Olga Kurylenko), the woman from Jack’s dreams. Secrets are revealed, motives are questioned, and Morgan Freeman shows up, looking more badass than usual. The plot of the film isn’t really the drawing point, even though it’s been taking some unfair flak for being unoriginal. It draws heavily from sci-fi films that have come before, some classic (2001: A Space Odyssey, Planet of the Apes, Solaris), some not quite (Independence Day, Moon), but these influences read more as Kosinski’s affection for the great history of sci-fi on the big screen rather than a lack of creativity. The plot is clever at structuring its revelations, and I can say I was honestly surprised. But it’s really the look and sound of the film that amazes. I cannot emphasize enough how gorgeous this movie is. I saw it in IMAX and it blew me away visually. Kosinski is possibly the first filmmaker to successfully incorporate the architectural aesthetics of video games in film—he's got a background in architecture, just so you know. He weds the sanitized, aerodynamic look of games like Halo and Mass Effect with the gritty, irradiated post-apocalyptica of the Fallout series. The result is masterful design, a film that actually makes video game aesthetics work on film. Claudio Miranda, the Oscar-winning cinematographer of Life of Pi, shoots the hell out of the picture, nicely utilizing short-focal length lenses, and smartly blending the CGI space-scapes with the haunting apocalyptic landscape of Iceland. Him and Kosinski got a knack for combining the real and unreal to make it seamless. Kosinski's also got a knack for music. He got Daft Punk to provide the beats for his debut feature, Tron Legacy, and this time he’s got France’s M83 to score the film. The music adds a lot. It ups the romance, the emotion, the stakes, but also suits the cool video game aesthetic. You end up thinking, “Of course technology that looks like this needs music like this.” The film's also got a great sound design. The drones have a particularly nifty buzz to them. Oblivion is an impressive film, cementing Kosinski’s reputation as a visionary director. It may be made from familiar parts, but nothing can diminish this unqualified triumph of design. Directed by Joseph Kosinski; written by Kosinski, Karl Gajdusek and Michael Arndt, based off Kosinski and Arvid Nelson’s graphic novel; starring Tom Cruise, Olga Kurylenko, Andrea Riseborough, Melissa Leo, Nikolaj Coster-Waldau and Morgan Freeman.